I know I've talked about this before, but I absolutely love baking on Sunday afternoons. My husband is usually catching up on class work - watching video lectures, inventing medical devices, basic engineering graduate school stuff! - so I have a lot of time to spend in the kitchen. Last week I splurged and made Brown Sugar Cupcakes with Vanilla Buttercream Frosting. But hey, this blog is devoted to casual indulgence, so those cupcakes were to be expected, right!? It's not like I bake decadent baked goods like that every week - the week before I made 70 Calorie Cookies, so I feel like it balanced out quite well! I tried to go back to a more healthy option this week. This recipe is from Cooking Light - one of my favorite cook books. 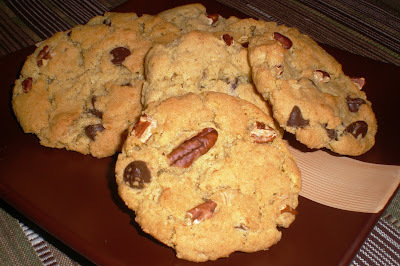 Enjoy this delicious cookie - I promise you won't even realize that it's a lighter version of a regular cookie! Preheat oven to 350 degrees. In a medium bowl, combine flour and next 4 ingredients (through salt), stirring with a whisk; set aside. Place sugars and butter in a large bowl; beat with a mixer at medium speed until well blended. Add vanilla and egg; beat until blended. Gradually add flour mixture, beating at low speed just until combined. Stir in pecans and mini chips. Drop dough by tablespoonfuls 2 inches apart onto baking sheets lined with parchment paper. Bake for 12 minutes or until edges of cookies are lightly browned. Cool on pans 2 minutes. Remove cookies from pans; cool on wire racks.